We regularly develop and produce new fabric projects. 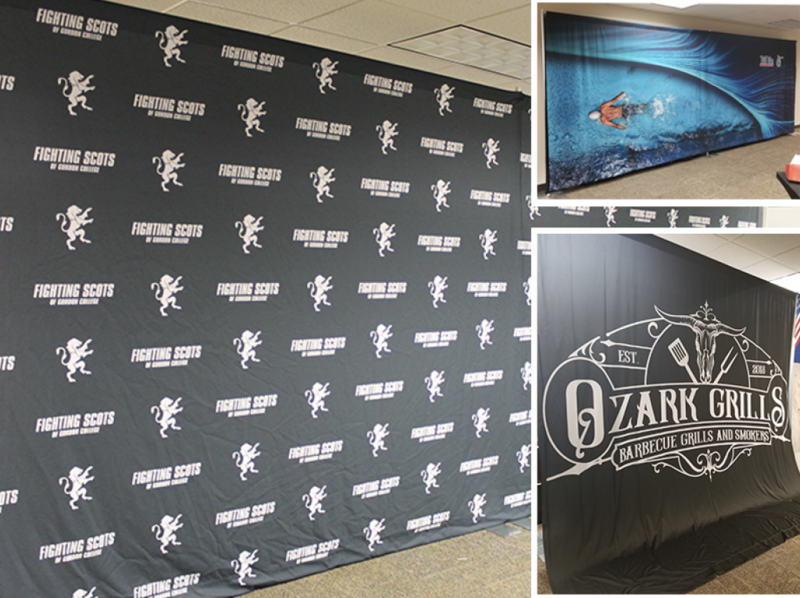 We know there is no one size solution when it comes to tradeshow and event displays. 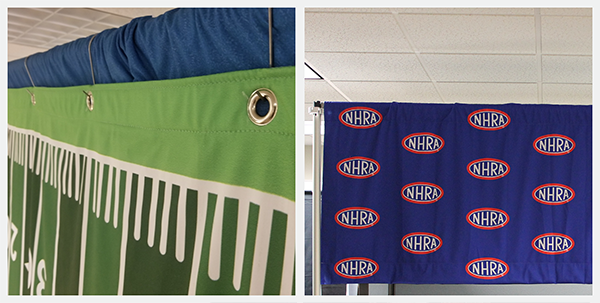 Having an in-house sewing team, and a graphics design team along with our ability to print wide-format comes in handy. Giving us the flexibility to produce pretty much anything you imagine. Therefore we do have the resource available bring your customer the fabric solution for their space, trade show booth or event display. We use a pipe and drape system which refers to pipe (aluminum or steel), fixed or adjustable telescoping vertical uprights. Supported by a weighted steel base. Also, adjustable telescopic or fixed horizontal pipes that provide a drape support frame with removable drape panels. 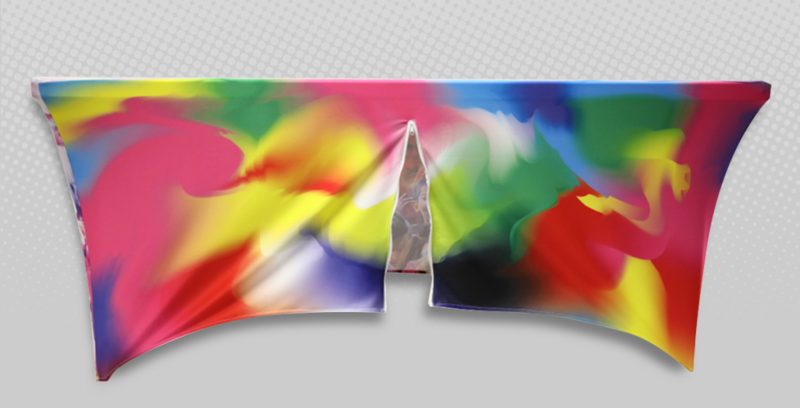 However, we print on 100% soft knit polyester fabric through a dye sublimation process. Dye sublimation uses heat to bond the image onto the material resulting in photo-quality graphics. That process creates stunning colors and in fact dyes the fabric threads. The printed fabric panels are washable in cold water and reusable. Furthermore, the fabric has a certified FR rating fire certificate. We have noticed that walls, fences, columns are all often underutilized branding and advertising opportunities. Take a creative approach to your walls and consider covering these spaces with printed fabric. Turn that fence into a …beautiful work of art, informational branding, event backdrop, directional signage, scenic stage backdrop, wayfinding system and many more. Start your project today! When you fill out our project form, a graphic design professional will help you to realize your image. When filling out, please be descriptive in the “Tell us about your project” section. It really helps to let us know how you are planning to use your drape. As well as where are you setting up, your hardware specifications (if you have any). It would certainly help when you feature some of your favorite designers or artwork even your visually favorite website. In our blog, we also have a guide on how to get the most of our design services. Give it a read. World rejoice! Now we print on Spandex. 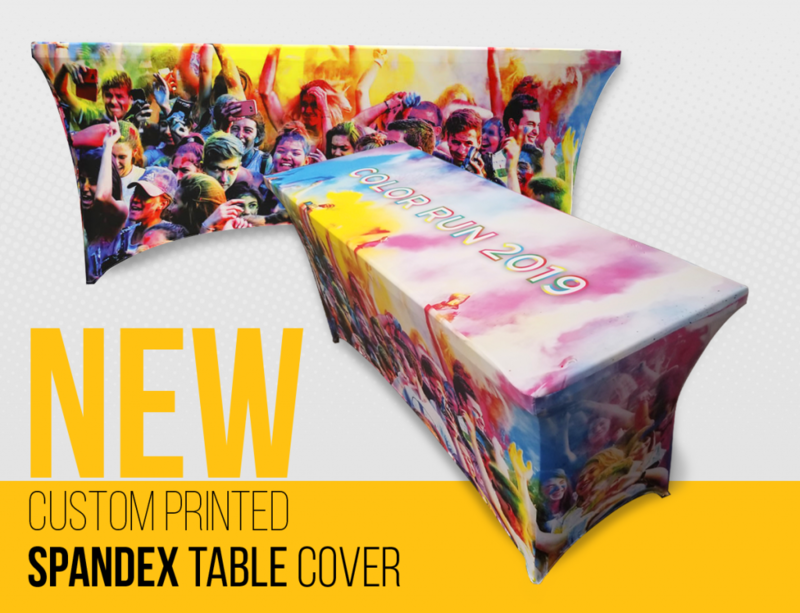 We are proud to announce our new Custom Printed Spandex Table Covers. 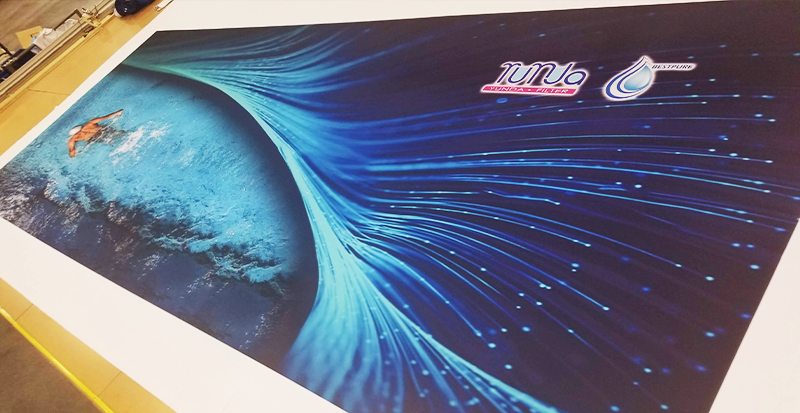 Five-sided printing, wrinkle-free, dye sublimated spandex table covers. Available in all the trade show standard sizes for 4ft, 6ft or 8ft table, and width of 24in or 30in, and with three different options at no additional cost: regular, open-back or zipper-back. See it to believe it. Regular – Traditional spandex cover where the edges come close to the ground on each side. Open Back – Designed for someone to comfortably sit on the other side. The back has a higher arch. Zippered Back – A vertical zipper is featured along the back so it can be easy to open for storing items under the table. Illustrator and Photoshop templates are available. We do offer graphic design help. 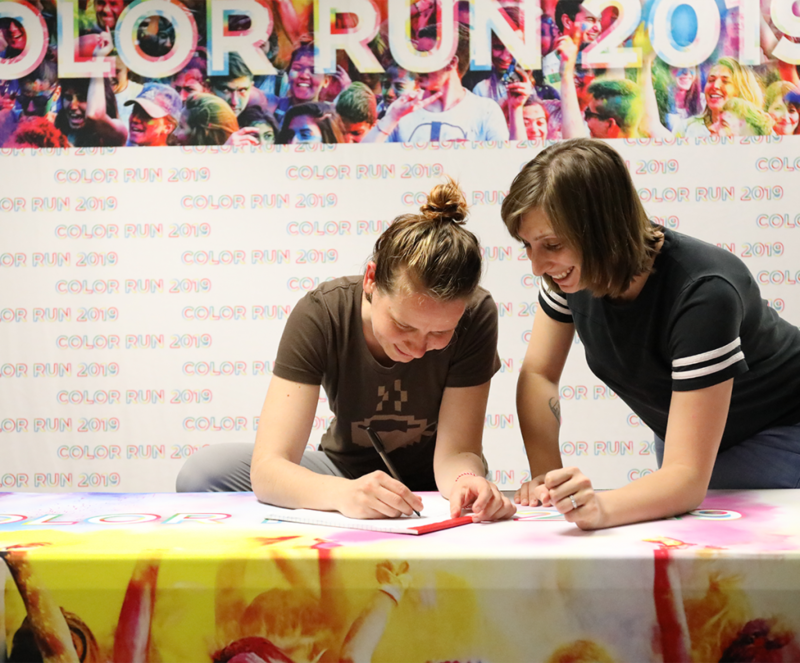 As you should know by now any time you request a free mockup, we have a graphic design team on staff who works directly with you – the client – to create an exciting attention-grabbing backdrop for any show or event. Tell us about your project or, how are you planning to use the backdrop? It will be of great help for our designers to know how are you using the backdrop. Are you displaying it at a trade show? That will dictate the placement of images information and web address usually tradeshow exhibitors have a table about 3 ft. tall in the booth, knowing this the artist can plan and move all relevant info and images above the 3ft mark. Displaying at a party or outside my indicated that the backdrop should be an inch shorter in order not to touch the floor and prevent dirt from staining the bottom. To get the most out of our designers please share with us some images/websites/social media posts that you think are well designed even if the images do not apply directly to your project. It will help to understand your graphic design style and expectations helping us create something you absolutely love. 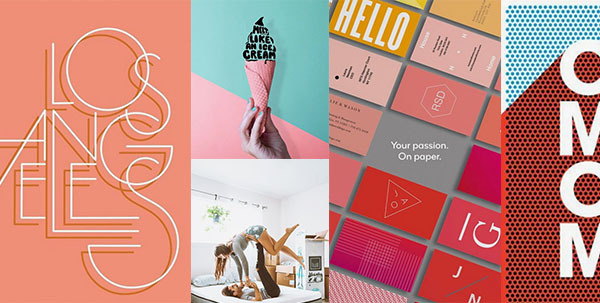 You can use Pinterest or Behance for inspiration. Tell us what size your backdrop needs to be. 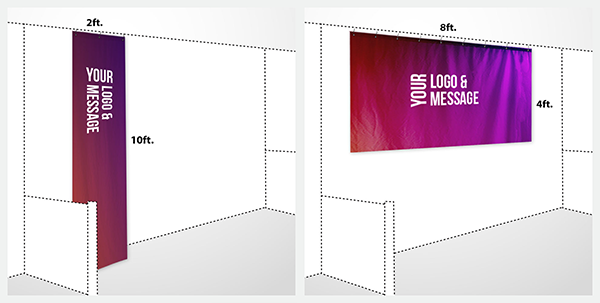 On our mockup form, we have your standard booth size. Not to be confused with backdrop sizes. Your booth will dictate the size of your backdrop, but if you are not exhibiting at a booth let us know. That is another important one that I can’t stress enough knowing in advance if you have the existing kit or if you are planning to use grommets and hooks or do you have your hardware, and you need a specific size to cover it. Knowing this in advance will speed up the design process as well as minimize mistakes. Since the beginning of Custom Exhibit Backdrops we have always shipped ground for free all over the continental United States. We typically use FedEx Ground®, FedEx Standard Overnight® and for larger shipments FedEx Freight Priority® and ESTES Freight. 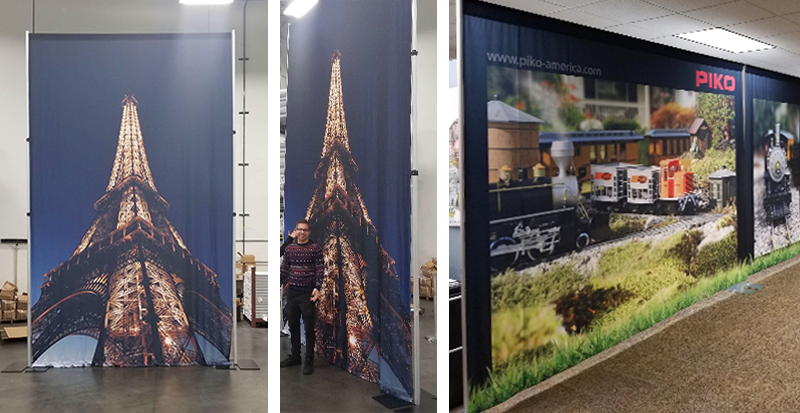 If you have a relationship with a different service and like to use it email us at exhibitbackdrops.com to set up shipping details. *Note: If a lift gate is required or a residential freight delivery, additional shipping charges may apply. 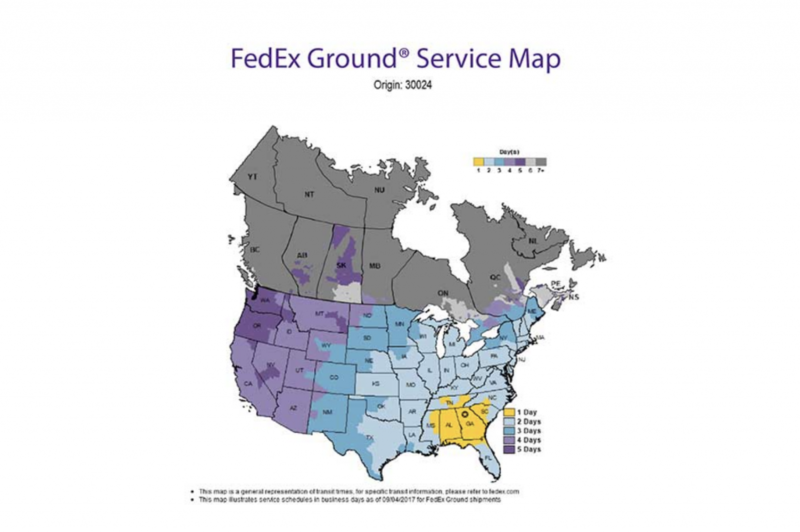 For FedEx 2Day® the transit time is 2 days from the day it leaves our location with an estimated delivery by 4pm. For FedEx Standard Overnight®, the transit time is 1 day from the day it leaves our location with and estimated delivery by 3pm.